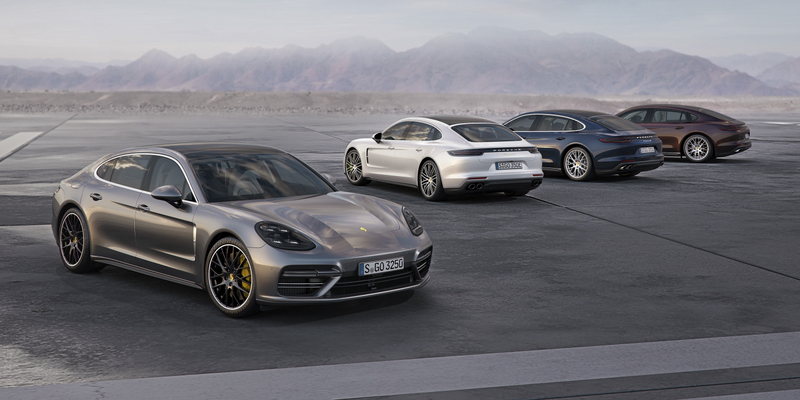 With the addition of the new 330 hp versions and the Executive models, the Porsche Panamera range now comprises ten different models with power outputs from 330 to 550 hp. Porsche is continuing to expand the model range of the new Panamera: At the Los Angeles Auto Show (18-27th November 2016), the sportscar manufacturer will be presenting the luxury saloon with a new 243 kW (330 hp) V6 turbo petrol engine, along with an extended Executive version as yet another body option. The new V6 turbo is a highly efficient and agile entry-level addition to the impressive range of engines. Power is up by 20 hp from the corresponding engine of the previous Panamera generation. At the same time, Porsche was able to reduce the consumption of this completely redeveloped six-cylinder petrol engine by up to 1.0 l/100 km. The new 330-hp engine is combined with rear-wheel drive in the Panamera and all-wheel drive in the Panamera 4, plus a long wheelbase in the Panamera 4 Executive. While the Panamera and Panamera 4 with 330 hp redefine what can be expected at the entry-level end, the Executive models of the big Porsche, with their 150 millimetre longer wheelbase, expand the body and equipment portfolio at the top end of the model line. Designed as a chauffeur saloon, this Porsche is available in the all-wheel drive versions Panamera 4 Executive (243 kW / 330 hp), Panamera 4 E-Hybrid Executive (340 kW / 462 hp), Panamera 4S Executive (324 kW / 440 hp) and Panamera Turbo Executive (404 kW / 550 hp). The new Porsche Panamera Executive versions are equipped even more exclusively. The standard features are supplemented with a large panoramic roof, heated comfort seats with multi-way electrical adjustment in the front and rear and adaptive air suspension with an electronically controlled damper system (Porsche Active Suspension Management / PASM). The roll-up sunblind behind the headrests in the rear also comes as standard. The standard equipment of the Panamera 4S Executive and Panamera Turbo Executive is even more comprehensive: Among other things, both models benefit from rear-axle steering and soft-close doors. As the most powerful model, the Panamera Turbo Executive is equipped with standard features such as four-zone climate control, LED main headlights including Porsche Dynamic Light System (PDLS) and ambient lighting. As an option, all Porsche Panamera Executive models are available with a newly developed, large rear centre console, which can also be equipped with two integrated folding tables and an inductive antenna connection for an additional smartphone, depending on the market. Similarly to the existing Panamera models, the exterior of the Executive versions can be further individualised with a Sport design package. Another useful equipment option, particularly for the Executive versions frequently used as chauffeur saloons in China and the USA, is the latest generation of Porsche Rear Seat Entertainment. The 10.1-inch displays integrated in the backrests of the front seats can be detached for a wide range of uses; when needed, they transform the rear of the Panamera into a fully digitalised workplace. The high-quality displays can also be used as tablets outside the vehicle. With regard to the model line, the fully redeveloped second generation of the Panamera was introduced in the summer of 2016. The four all-wheel drive models Panamera 4S, Panamera 4S Diesel (310 kW / 422 hp), Panamera 4 E-Hybrid and Panamera Turbo are already available on the market.